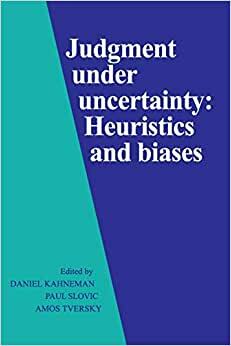 The thirty-five chapters in this book describe various judgmental heuristics and the biases they produce, not only in laboratory experiments but in important social, medical, and political situations as well. 5.0 out of 5 starsThe one and only. If you read only one book on behavioral decision making, this is it. Thinking Fast and Slow is the abbreviated version. This is the original. I purchased and read this about five years ago. It is probably the most influential book I have ever read. It spawned an interest in a number of related books and on thinking in general. It is scholarly articles, but I found it to be quite readable--just a lot of detail. I agree with the reviewer who wished for a version aimed toward high school students. The essays contained in this book show convincingly that the standard decision theoretic model taught world wide since the mid 1940's,the subjective expected utility model based on the subjective approach to probability of Ramsey,De Finetti,and Savage,is not supported by the experimental evidence.The essays successfully show how the use of Prospect Theory accounts for the underweighting(subadditive-subproportional) and overweighting(superadditive-superproportional)of decision weights(non linear "probabilities").Three basic judgmental heuristic operations are preformed by decision makers in the real world.These operations are intuitive and based on the perceptions of the decision maker.The first heuristic that decision makers use in making probability evaluations is called representativeness.Judgments of probability are based on what is perceived as similar.The second heuristic is the availability heuristic.It,like the third heuristic,specifies that decision makers concentrate only on that evidence,upon which the probabilities will be estimated,that is most easily obtained or is immediately available.The third heuristic is called the anchoring heuristic.Decision makers use only that evidence that comes first.Tversky and Kahneman,as well as all of the other essay authors,argue that their experimental evidence demonstrates or shows that decision makers do not understand the mathematical laws of probability(additivity of probabilities,addition principle,multiplication principle,marginal probability,conditional probability,joint probability).They also do not understand basic statistical concepts(regression to the mean of a probability distribution). In 1921,in his A Treatise on Probability(TP),J M Keynes pointed out that the purely mathematical conception of probability was a very small subset of what he called the logical theory of probability.In order to apply the purely mathematical laws of probability correctly,a decision maker had to have a complete sample space of all possible outcomes specified in advance.An equivalent assumption is that the decision maker knows for certain what the particular probability distribution is.Secondly,probability preferences would have to be specified by a complete order that was linear or proportional.Any decision situation that did not satisfy these conditions had a weight of evidence less than one.Keynes specified a variable,w,called the weight of the evidence,that measured the completeness of the relevant,potential evidence that was available to the decision maker.It was defined on the unit interval between 0 and 1,just like Ellsberg's rho variable that would serve as a measure of the ambiguity of the evidence.The existence of ambiguity automaticaly will lead to violations of the purely mathematical laws of probability.Contrary to Kahneman and Tversky,Ellsberg,like Keynes before him,argued that these calculations are not erroneous and the decision makers are not irrational or biased.The claims made by Tversky, Kahneman and their many followers(Shiller,for example),that the subjects in their experiments are probabilistically and statistically illiterate,makes no sense because the problems that are presented to the experimental subjects do not allow the subjects to unambiguously define a unique probability distribution or a complete sample space of all possible outcomes(some examples are the blue-green taxi cab problem,the rare Asian disease problem,the battlefield problem,the Linda-bankteller problem,and the lawyer-engineer problem).Let us now turn to the representativeness heuristic.The representativeness heuristic turns out to be none other than Keynes's degree of similarity or likeness or resemblance discussed by Keynes in chapter 3 and Part III of the TP.The anchoring and availability heuristics are identical to the statement that the weight of the evidence is less than 1 for a real world decision maker.Keynes showed that decision makers would usually be able to use interval estimates(upper-lower probabilities) only.You automatically will violate the mathematical laws of probability,which only hold in the limiting case where w=1,given linear probability preferences.Keynes also showed this in his examples of his conventional coefficient of weight and risk,c.The answers obtained when one applies the c coefficient will be sub and super additive.Keynes ,however,would argue that these are not biases or errors,but correct calculations obtained with incomplete information.The vast majority of decision makers are attempting to reason probabilistically without the benefit of knowing a unique probability distribution,a complete sample space,or being able to specify a complete order over all outcomes.They are rational.Tversky and Kahneman are requiring "SUPERRATIONALITY".Every calculation of a probability estimate that does not have a weight of 1 or violates Carnap's rule of total evidence will violate the mathematical laws of probability.L J Cohen,repeating Keynes's argument,spent 20 years trying to get this point across to Kahneman and Tversky in the journal Brain and Behavioral Science(1975-1994) .Tversky's support theory is a belated attempt to remedy their omission,but it has not been successfuly integrated into Prospect theory(1979)or Cumulative Prospect theory(1992),where the weighting function is still a function of a single variable representing probability,although additional parameters have been incorporated into the model.One could argue that it is Tversky and Kahneman who are irrationally insisting that decision makers use the mathematical laws of probability in situations where those laws are not applicable.